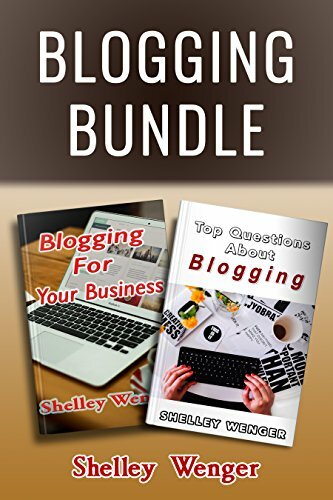 Buy one, get one free!For those who need more knowledge, Shelley Wenger is proud to offer her latest book, Blogging Bundle. In it, she combines two of her books, Blogging For Your Business and Your Questions Answered: Top Questions about Blogging.If you have a business, you know that being online is the key to success… and that includes having a blog. If you don’t know where to start, Shelley Wenger’s Blogging Bundle could be just what you need!Blogging Bundles includes advice on all of the following topics, specifically designed to help small and large business owners on their blogging journey: What Is a Blog?Why Do You Need a Blog?Once You Decide to Blog, How Often Should You Blog? How To Find a Topic for Your Blog How To Find Things To Write About Week After Week What If I Can’t Write a List? A Little Thing We Call Writer’s Block No Blog Is Complete Without Pictures! Why You Have To Be Careful With Your Pictures? So, Where Can You Get Safe Pictures For Your Blog? Reasons To Delegate Your Blog (Or Other Business Tasks) Time: The Best Reason to Delegate Reasons To Hire Me To Write Your Blog And much, much more! If you want to reach more customers with a blog, pick up a copy today!